Around the Wood River Valley, long-time local John Caccia may be best known as a jewelry maker, river guide and dad to Cody and Wyatt. But in recent years, he’s gained a new identity as a seed saving expert. 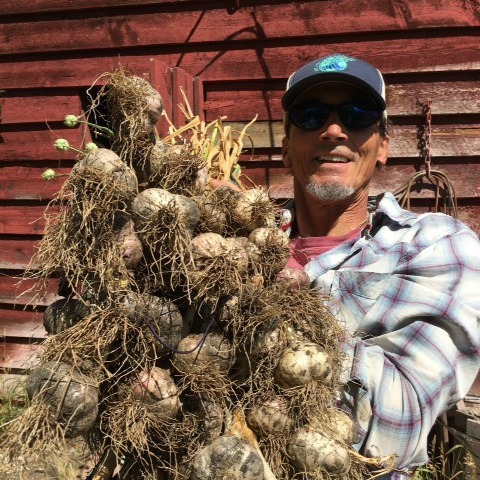 Born and raised in Pocatello, Caccia planted his first veggie garden in the early 1980s and was instantly hooked. Three decades later, he is now managing a local seed library, helping create a local seed bank, and encouraging other local gardeners to give seed saving a try. How did you get into seed saving? I was inspired by taking a 5-day “Seed School” taught by Bill McDorman. Understanding how plants pollinate and then completing the plant’s growing cycle myself instead of relying on seed companies to provide seeds for me every year. Spending time outside and learning all the amazing ways Mother Nature expresses herself. When and why did you help start Wood River Seed Library? Wood River Seed Library (WRSL) was founded in the spring of 2014. We originally were hosted by the Hailey Library and moved into the Ketchum Library in 2015. I started the WRSL to share seeds and bring more seed awareness/appreciation with the community but more importantly to inspire local growers to begin seed saving themselves. Tell us about Rocky Mountain Seed Alliance. Rocky Mountain Seed Alliance (RMSA) was founded in the spring of 2014 and, in three years, has grown into a nationally recognized seed conservation organization. Our mission is to assure a diverse and abundant supply of locally grown seeds for the Rocky Mountain region. We do this through education, networking and establishing community-based models of “seed stewardship.” We have several ongoing programs and events! See: www.RockyMountainSeeds.org. How did you become so passionate about gardening? It feels good to spend time in the soil, learning and working with all the elements, watching the plants grow and basically connecting with Gaia. Eating the “fruits of this labor” and receiving all the health benefits is also rewarding and empowering! You’re also a beekeeper. Please explain! What are some easy first steps for novices who want to try seed saving? Start by learning how easy it is to save “self-pollinating” seeds. At RMSA we suggest by starting out with saving the seeds of just one variety. Choose which plant you are passionate about or most interested in and become knowledgeable on how to select for and save those seeds. Grow, harvest and share those seeds with the community via the WRSL and receive the best and most locally adapted seeds that the other local growers are producing. What do you do when you aren’t saving seeds? Working as a silversmith creating meaningful, top-quality silver jewelry for active people (including a jewelry line for gardeners! See at the Golden Door Gallery in Ketchum or online at: www.MountainAngels.com), playing music, hot springing, camping, boating, cycling, snowboarding and social dancing. Manon Gaudreau, John and Jini Griffith, Kelley Weston, Pam Street, Judy Foster, Katja Casson, Kaz Thea, Kim Mazik, Jabbara Edwards, Belinda Forgeon, Miles, Teitge, Travis Scott, Chrissie Huss, Joanna Moore, Claire Casey, Marie Mohler, Susan Michael, Sharon Browder, Kerrin McCall, Dana Dugan, Keith Selner, Lynea Petty, Sara Berman, Natalie Ertz, Suzi Ayers, Paddy “Crazy Guy Tomatoes” Mcllvoy and the WRHS W.A.T.E.R. Club.